There certain foods that just make me weak at the knees – fresh homemade pasta, Meatballs or cheesecake these are death-row meals as far as I am concerned…..but this just crowns the lot of them….Pulled Pork!!! 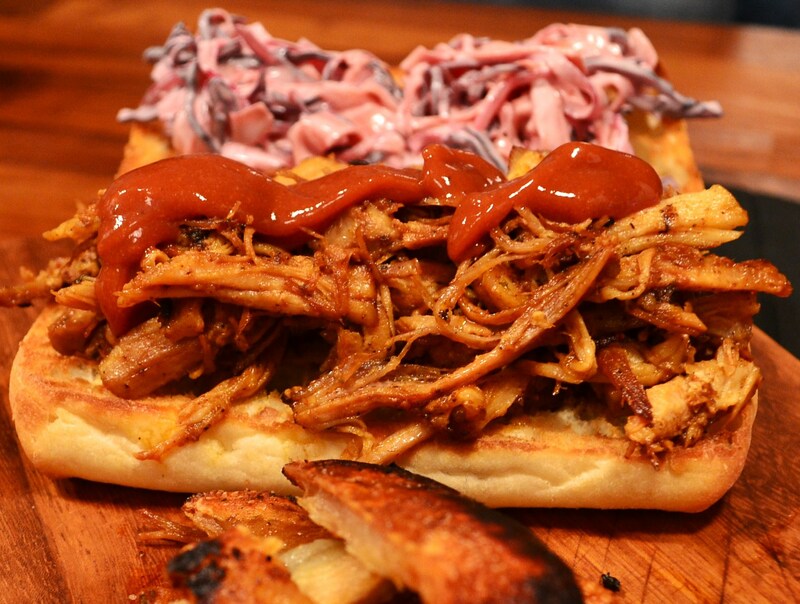 I can’t resist it It’s probably down to the fact that it’s an amazing meat to cook low and slow and the fact that it is usually served in a bap with a crunchy creamy coleslaw…whatever….Pulled Pork is what I want to be smothered in when I feel less than groovy!!! 1 medium bunch of fresh thyme chopped. Start by combining all the ingredients for the marinade in a deep roasting tray, taste and season as required. Next drop the belly pork into the marinade and make sure it is well coated including the skin side. Cling and sling in the fridge for a minimum of 2 hours or if you have the time 48 hours – longer the better!! To cook simply foil the tray with two sheets of baking foil and roast low and slow at 150c for 2 hours. To pull the pork remove it to a chopping board, peel off the skin then shred with a couple of forks. The skin can now be grilled hard to produce a cool crackling to serve with the pork. When the pork is shredded it can be kept until you need it – simply warm through on a pan then arrange on one side of you bap complimented by a cool crunchy slaw on the other side.